Once I got into it, I was very happily surprised. It wasn’t nostalgia, it was obsession tempered by affection. It used its subject matter as a metaphor for a time when things were perhaps less overwrought, and a little more genuine. All this in the least genuine setting of all – virtual reality. That is should work as a story at all, given all its contradictions, shows how carefully Cline worked his subject material. That it should transfer to the screen without losing too much of what makes it great is down to the fact that Spielberg understands the subject matter also, and respects it. Wade Watts is a Gunter, or egg-hunter. One of a collection of obsessive gamers who spend their time in the virtual reality everyone plugs into, the “Oasis”, in search of an easter egg, or hidden artifact, which will give whomever finds it control over the entire Oasis. The real world has, partly due to geopolitical events, and partly due to the ability to escape to the Oasis, become a slum. This is effectively visually conveyed when you see the “Stacks” at the beginning of the story – vertically stacked containers held together with scaffolding inside which thousands of people live. A modern metal shanty town. Corporate economics have run their course and the largest companies in the world appear to be games manufacturers that provide people with the ability to spend their time in the Oasis, forgetting what life on the outside is like. The Oasis is where people forge friendships, build careers and invest their time and energy. The existence of the easter egg, put there by the now-dead creator of the Oasis, James Halliday, changes everything, because whomever controls the Oasis controls the most valuable piece of real-estate in the world – the whole of the virtual construct. IOI, the second-largest games company in the world, will stop at nothing to seize control of the Oasis, and their ruthlessness spans the gap between the virtual and the real, through the use of indentured servitude on the outside to provide workers in the virtual world. Since Halliday was an obsessive fan of 1980s culture, all the clues to the location of the three keys that give access to the easter egg are buried in 80s pop culture, and Gunters are all experts in the field. 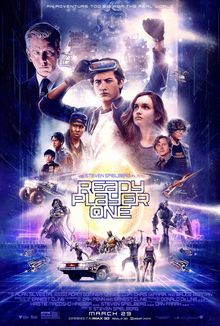 This provides unlimited opportunities to meld high-resolution virtual reality with 1980s movies, style and computer games, and this formed the backdrop to the book and to a slightly lesser extent, the movie. The execution is excellent, the movie full of so many references it would be impossible to catalogue them all, and the adventure as thrilling as the best of the Indiana Jones franchise. I enjoyed it immensely and suggest you go see it without delay. However, you should also read the book. As good as the film is, it doesn’t quite have the emotional impact the book had, nor can it, because of the format, convey the same respect and affection for the culture of the 80s as the written word. Although I enjoyed it, I felt the movie fell short in terms of the emotional attachment I formed with the characters and the extent to which I was invested in the outcome. Perhaps this is because its hard to care about characters that don’t look entirely human most of the time. Perhaps it’s because most of the movie feels so virtual rather than real, and perhaps its because the link between the outcomes in the virtual world and the consequences in the real world is not sufficiently explored (although it is explained…). This is not to criticise the movie, but only to explain where it doesn’t quite manage to strike the same notes as the book. Together, the two give you the visual feast and the narrative richness, and that’s how it works best.